An ultralight high-performance mechanical watch made with graphene was recently launched in Geneva at the Salon International De La Haute Horlogerie. The University of Manchester collaborated with watchmaking brand Richard Mille and McLaren F1 to develop the world’s lightest mechanical chronograph by combining precision engineering with leading graphene research. The RM 50-03 watch was made from a unique composite incorporating graphene used to manufacture a strong but lightweight new case to house the fragile watch mechanism. The graphene composite used here, Graph TPT™, weighs less than previous similar materials used in watchmaking. Graphene is the world's first two-dimensional material at just one-atom thick. It was initially isolated in 2004 at The University of Manchester and is capable of revolutionizing an increasing number of applications such as bendable, flexible tablets and mobile phones and next-generation energy storage. 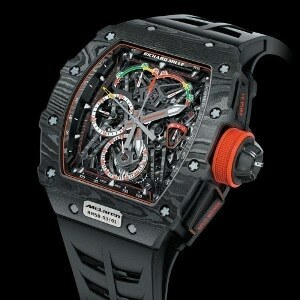 The addition of graphene material has helped to improve the strap of the new watch. Graphene was also injected into the rubber of the strap, resulting in enhanced resistance to wear and its mechanical properties. On the whole, the ultralight watch weighs only 40 grams and is exceptionally durable. Details about the new watch and the collaboration was recently unveiled in Geneva by; Richard Mille, Zak Brown, McLaren F1 CEO, Eric Boullier, McLaren F1 Racing Director and new McLaren-Honda F1 driver Stoffel Vandoorne. Insights on the benefits of using graphene were provided by James Baker, Graphene Business Director and Professor Robert Young from The University of Manchester. The project with McLaren and Richard Mille involved an investigation into the possibility of incorporating graphene into components in composite watches to enhance performance with the view of saving weight. We evaluated the effect of including graphene in both the watch case and strap. We helped in the fabrication of the different components and analysed their microstructures using x-ray computed tomography and Raman spectroscopy, along with a detailed evaluation of their mechanical properties. We have shown that the incorporation of graphene into the watch case can have major implications for improved performance of the component in service and also enable further weight reduction in future designs. This remarkable watch has been accurately designed and inspired by the wishbone suspension structure of a McLaren-Honda Formula 1 car. Integrating the materials and design has enabled the casing of the watch to withstand tremendous shock damage and it also survived unscathed in tests. Richard Mille referring to the RM 50-03 watch stated that, “McLaren were already pioneers in the application of carbon to F1 cars back in the 1980s, and many aspects of our approach dovetailed nicely. We share the same desire to combine lightness and speed with durability. This collaboration has brought together three leading organizations who strive for excellence and perfection in their fields. The results from this project have shown exactly why graphene is perfect for delivering improvements where high-performance materials are necessary and is a key step forward into developing more widespread applications including automotive and aerospace.